Dublin effectively shuts down on Christmas, so we planned ahead and booked a tour of the city. The weather didn't exactly cooperate but good times were had. Our tour with Tom the Tour Guide began under an arch across the street from the Stephen's Green Shopping Centre we saw yesterday. The walk over there was pretty eery because just the night before the streets had been teeming with shoppers and now the only few souls out were the homeless. Tom the guide directed our attention to the arch we were gathered under to reveal a memorial to the Irishmen that died in the Boer War. It seemed that just about every statue and monument in town had its own nickname. Tom said some people call this traitor's arch because the soldiers listed here died fighting for the monarchy. We then entered St Stephen's Green. It was pretty shocking how green it was considering it's Christmas Day. There were even quite a few flowers in bloom. This installment represents the potato famine. Tom the guide said that a million people left Ireland during the famine and another million died. He told us about a ghost story in Ireland called the Hungry Grass. He said there are lots of unmarked graves from the people that died of hunger, and if you walk over the spot they're buried that you'll be overcome with a supernatural hunger and will be unable to move until someone brings you some bread. This is the Huguenot cemetery. I've been hearing a lot about the Huguenots recently. I believe the French church next to the Gendarmenmarkt Christmas market we visited in Berlin was built for Huguenots as well. The Huguenots were a protestant group in catholic France that fled persecution and ended up in all sorts of interesting places. This statue of Oscar Wilde's nickname is "The Quare on the Square". Our guide told us that this area also served as a lamppost museum, with many different examples of historic lampposts. The cleaning lady at Finn's Hotel apparently inspired James Joyce's Ulysses. There are lots of plaques around town marking where events in the novel take place. Molly Malone has all kinds of good nicknames including The Tart with the Cart, The Dolly with the Trolly, The Dish with the Fish, The Flirt in the Skirt, and The Trollop with the Scallop. Wikipedia says that Molly Malone's little song is sort of an unofficial Dublin anthem. Fancy door to Trinity College. 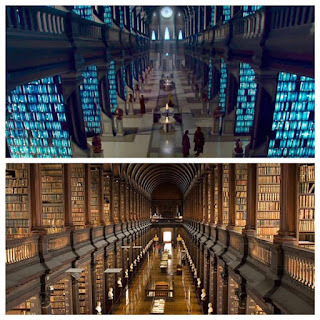 Trinity College sued George Lucas due to the similarity between their library and the Jedi Archives seen in Star Wars Episode II: Attack of the Clones. This is definitely my favorite statue punny nickname. 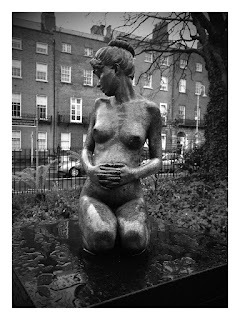 The statue depicts the four corners of Ireland coming together to form a nation with a fountain in between them. Nickname? "Urination Once Again". Golden! The Why Go Bald neon sign is a Dublin Landmark. I believe this is a bar in... Temple Bar. Temple Bar sounds like it's sort of the touristy part district. Our guide said that there are lots of street performers and others asking for money in different ways around here. Well one night he and his friends didn't have money for beer and needed a plan to make some money on the street. None of them knew how to sing or anything, so he shouted that he was the most ticklish man in the world and that tickling him would cost you 1 euro a minute. He said things were going pretty well until a bachelorette party came by. He said he made 10 euro from them but that it was hard earned. Our guide told us that this plaque was placed here by pranksters to commemorate an event that never happened and everyone is just going along with it. The General Post Office where the ill fated Easter Rising took place. A statue commemorating the same. This thing's nickname is the Stiletto in the Ghetto. Pretty amusing. Recently this thing has been rigged to glow red like a lightsaber to promote the recent Star Wars: The Force Awakens. St. Stephen's Day is the day after Christmas, and is a big shopping day around these parts. Well it was cold, rainy, and windy and we'd had about enough of that. We went back to the apartment and cooked some spaghetti and watched some Christmas movies on TV. 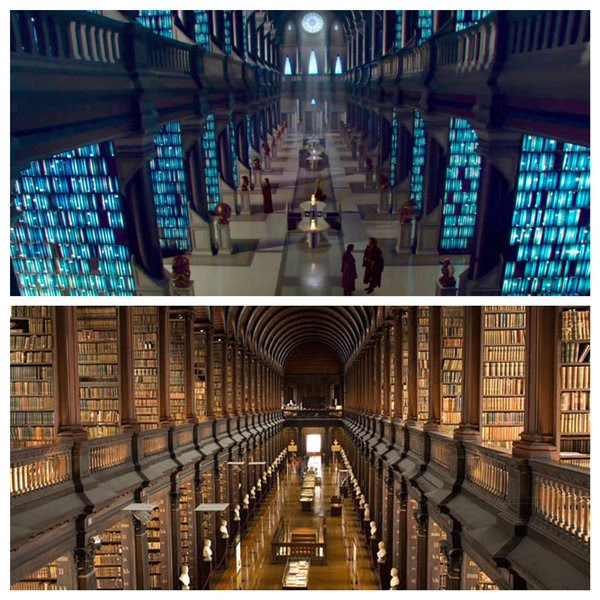 It turns out the Irish watch pretty much the same old Christmas movies we do. Some channel surfing turned up this Christmas message from the Queen. The apartment had a washer/drier combo thing which was nice to have but difficult to get to work properly. We picked up some sandwich ingredients for tomorrow's lunch on the road. I was mostly just amused by "crumbed ham". It's pretty much like it sounds, just has an inexplicable edge of bread crumbs on it.